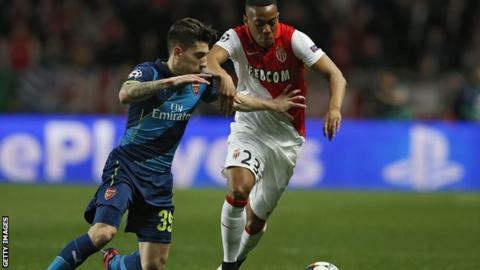 Manchester United's £36m signing of French teenager Anthony Martial shows the lack of top quality players available to big clubs, says Arsenal manager Arsene Wenger. Martial, 19, joined the Red Devils from Monaco on transfer deadline day. Wenger has been criticised for only adding one player - goalkeeper Petr Cech - to his squad this summer. But he told BeIn Sports: "The problem at the moment is finding the players that guarantee you are a better team." He added: "What happened last night with Monaco, who sold Martial to Manchester United for 80 million euros - Martial scored 11 goals in the French championship - that sums it up well. "That means it's not the money that's missing at the moment, it's not the desire of investment that is missing, it's the number of players available who can strengthen the big clubs." Arsenal were the only club from the top five European leagues not to sign an outfield player in the summer transfer window, leading to criticism from fans. But Wenger said: "Am I happy with the investment I make? Yes, every time. I bought (Alexis) Sanchez, I bought (Mesut) Ozil, I bought Cech, I bought Gabriel last year. "You have to find the players to invest in." The Arsenal Supporters' Trust has called for a the club to carry out an inquiry into its transfer policy. Earlier this year, Arsenal director Philip Harris said the Gunners had the money to sign "anyone but Cristiano Ronaldo and Lionel Messi".